So far we’ve been drawing objects from the side or face on. But what about drawing an object from an angle? Let’s take the tractor you learnt to draw earlier. This time you’ll need to show both front wheels not just one. Draw three circles to make wheels. Look carefully at the position and size of each of the circles. To make the hubcaps draw a smaller circle inside each wheel. 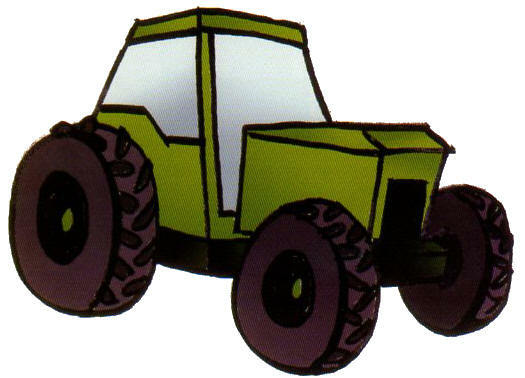 Next draw the body of the tractor. 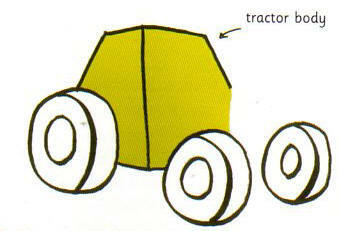 To start try drawing a vertical line from top to bottom in between two of the wheels as shown above. 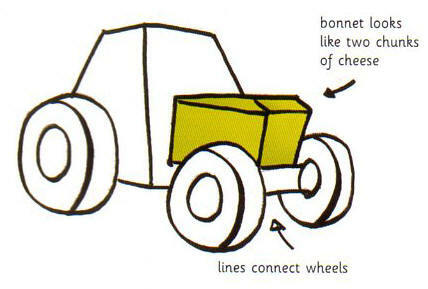 Draw two lines to connect the front wheels. Now draw the bonnet above the lines as shown on the left. This is the hardest part so it might take a few attempts to get it right. 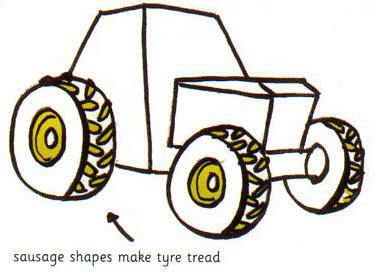 The Tractor tyres need good tread -you can make this by drawing lots of little sausages! 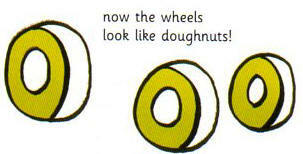 When you’ve done that add a circle and a curved line to two of the wheels as shown. To finish off add some windows and a black rectangle for an engine grill. Then colour in your farmyard masterpiece.